Are you interested in colored wedding dresses... something other than white or ivory? Like you, more and more brides are looking for something unique. This uniqueness will manifest itself in the form of the design, fabric finish and the color of a bridal gown. If you want a dress that will give you an "instant wow factor" when walking down the aisle... then consider a colored wedding dress or even a white wedding dress with color added to it. Make sure the color works with your hair and skin tone. Some colors can make a person look washed out and others can enhance your coloring. Try different shades of a color to get just the right one that will enhance your coloring. Consider your theme and wedding formality. 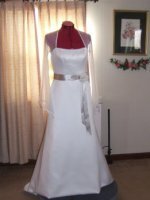 If you are having an ultra formal wedding you may not want to choose a red wedding dress or black wedding dress. These colors are still considered faddish for some societies. After you have chosen your wedding dress color take great care in choosing the color of your bridesmaids dresses. They must enhance your dress, not take away from it. What color wedding dress are you looking for? Some of the trendy colors bridal designers are making bridal gowns in are listed below. These links take you to pages with a gallery of wedding gowns in various styles that are flattering to your figure. To add to the list of wedding dress colors above now there are colors like silver, pewter and purple. Plus colors with exotic names like mocha, latte and fawn. If you can't seem to bring yourself to wear a gown made in one solid color, then consider wearing a white wedding dress with color added to it. There are styles that have beading, lace and embroidery to accent the gown in a contrasting color. Some gowns have insets, belts, sashes, collars and yokes made in contrasting color. Some popular color combinations are red and white wedding dresses, black and white wedding gowns and navy blue and white. Designers who have some in their collections: Kitty Chen, Watters, Maggie Soterro, Sophia Tolli , Bonny Bridals, Davinci Bridal and David's Bridal have a couple of wedding gown styles where you can choose a dress in a number of color combinations. So if you are looking for a unique "attention grabbing" bridal gown... then consider a colored wedding dress for your perfect wedding dress! Learn how a wedding dresses with color can flatter your figure, depending on where the color is placed on the dress.